Young children don’t always notice differences in people, at least not in the passively aggressive way some adults are inclined to do. Sadly, the recognition of characteristics dissimilar to their own either physical or behavioural is largely a mindset learned from their environment. 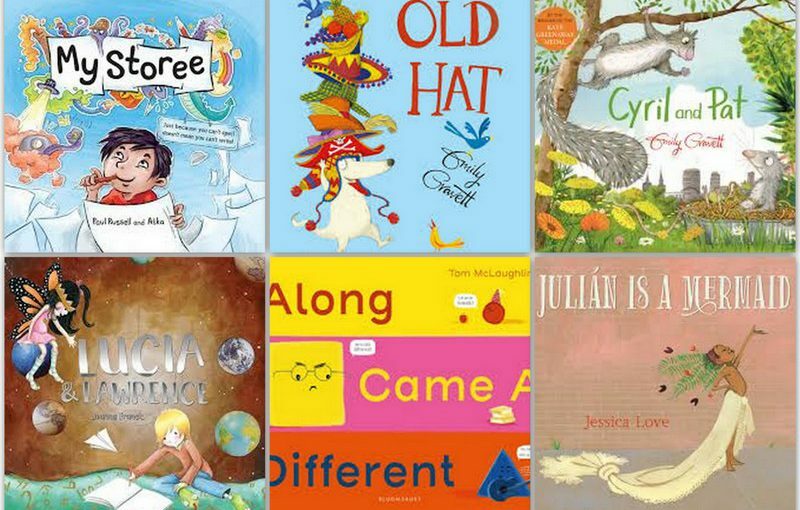 Picture books like these do a tremendous job of challenging erroneous mindsets and applauding individuality. They are charming and direct, yet subtle and entertaining enough to read repeatedly. 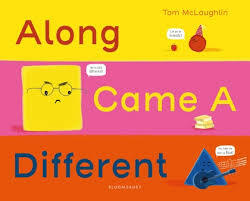 Dramatically different (pardon the pun) from anything else McLaughlin has produced before, this avant-garde picture book cleverly combines colour recognition (with emphasis on the primary colours), geometry and social acceptance all in one neat entertaining package. Several groups of differents converge into one community space but despise one another because reds, blues and yellows just don’t match. Rules are established and boundaries are enforced. Life is tense and restrictive. Until one day, quite unexpectedly, a really different different comes along, radically altering their perceptions and igniting a massive appreciation of how being different is actually better. Friendship prevails and happiness blooms. This story told in few words and bold striking characters, relays a simple premise of live and let love. It suggests to children that you can be any shape, size, or colour and still have a voice. You can like any type of music and have friends who love oranges even if you do not. You are unique and therefore amazing. It’s that simple. A modern day classic that welcomes differences and embraces change. Magnificent. Timely. Recommended. Australian NAPLAN advocates turn away now for this tremendous picture book blithely ignores language conventions and unapologetically dismisses sticklers for rules. I love how it also challenges every spell check on the planet. 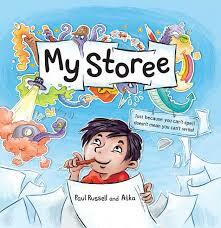 Derived from the author’s own experience with dyslexia, My Storee is a beautifully refreshing expose of encouraging creativity for creativity’s sake by forsaking the bounds of perfect spelling and correctness; paradigms that can severely road block learning and advancement for a person afflicted with dyslexia. A young boy is a master storyteller but is afraid to let his dragons loose at school for fear of grammatical reprimand. That is until a teacher with extreme foresight, long hair and very loud shirts breezes into his life and gives him permission to be who he is and shine. Thank you Mr Watson. Full marks for this book, which screams thinking outside of the box, applauds alternative teaching approaches and champions creative verve to the nth degree. I love it, every word and every ridiculously bold bright illustration. Viva la Mr Watsons, wherever you are out there. We need more like you. My Storee is concrete reinforcement of embracing who you are and all that you have, or have not, with verve and positivity.